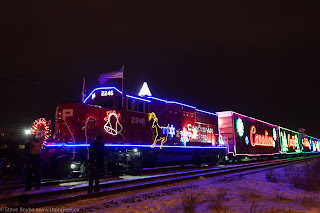 There are a few Canadian holiday/Christmas train events coming up that I wanted to bring to your attention. If you have any others, please comment and I'll add them! 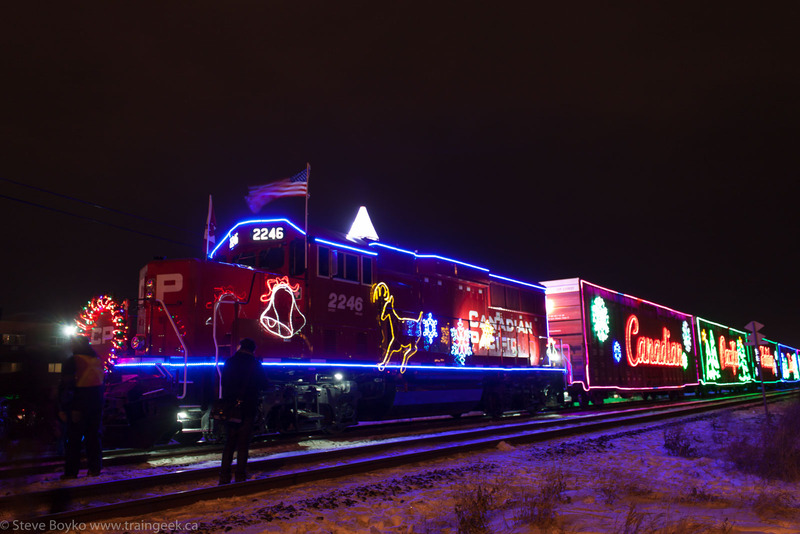 The CP Holiday Train is set to make its way across Canada and the USA again! The Holiday Trains gather food and raise funds for local food banks across North America. Come on out and see the shows and support the needy. The Canadian train departs Montreal on November 27 and will arrive in Port Coquitlam on December 19 (Canadian train information). The US train starts on November 27 in Montreal and visits New York state before traveling from Chicago to Iowa and then re-entering Canada to continue west (US train information). 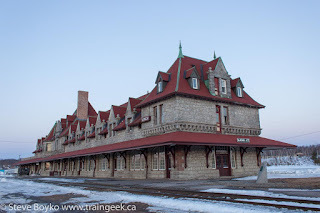 The McAdam train station in New Brunswick has been decorated for Christmas! Each room is decorated and volunteers are available to provide tours daily from 2 PM to 8 PM. The cost of the tour is $12/person and includes cider and treats, and the money goes toward the maintenance and improvement of the station. If you haven't been there for a while, go check it out - it's a beautiful station. Station Facebook page. CBC article. The South Simcoe Railway is running the Santa Claus Express every weekend starting on November 28 through December 20. Advance tickets are all sold out but "limited walk-in tickets are still available for these dates". The Winnipeg Railway Museum and Rail Travel Tours are offering a day trip by train to Gladstone, Manitoba. The trip starts at the museum in the morning of December 13 with a tour of the museum, lunch, and then travellers will board VIA 693 to ride two hours to Gladstone. In Gladstone ("Happy Rock") travellers can meet Santa Claus and enjoy crafts and games before riding a motor coach back to Winnipeg. The day costs $95/adult and $85/child and is a fundraiser for the museum. As a great bonus, the package includes a year's family membership to the museum, a $35 value! More information or call Rail Travel Tours at 204-897-9551. Thanks for posting this... 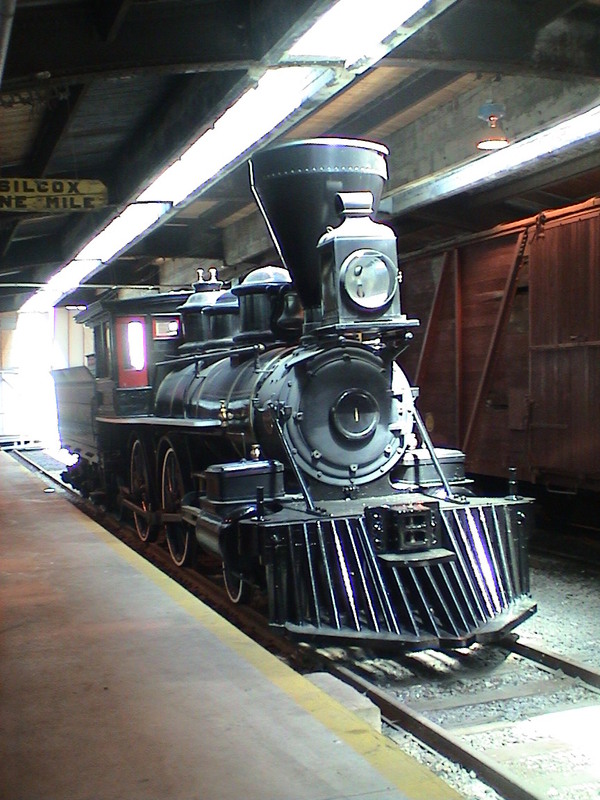 I had no idea about the Winnipeg Railway Museum's trip. Sounds like it'll be a great time! Steve, thanks for the info on train events for the holidays in Ontario. I'm going to try my luck!